We never meant to embrace tiny house living, especially not tiny house living with kids. We meant to embrace a lifestyle. Living in a tiny house has afforded us that lifestyle. Years ago, as newly married college students without much a of a dream for the future beyond finishing our degrees, we listened as one of our professors told us about a friend of his who, along with his wife, chose to work less and leave a lot of margin in his life. They lived a more simple lifestyle that gave them time to do the things they loved. The idea of margin was a new thing for us. We had no concept of leaving room in our busy lives for rest, and we often felt guilty when we told others we were busy, regardless of the fact that we always felt like we were running from one thing to the next. We lived for spring and summer breaks when life would slow down just a little. Americans, especially, seem to be really bad at the concept of margin. As a society, we subscribe to the notion that more is always better and if you are not working yourself to the bone, you are lazy. Overtime is often normal and even expected. Forget about even thinking of abandoning the forty-hour work week or stepping away from expected social commitments that come along with life in general. There is always another task that needs to be done, another meeting that needs to be attended, another class to sign up for, another party that cannot be refused. We spend our whole lives striving to attain some arbitrary goal, and we often sacrifice our sanity and our relationships in the process. When our professor suggested that there was another way, it was a light-bulb moment for us: a moment that changed everything. It didn't take long for us to realize that we couldn't have a big house on lots of land and embrace the lifestyle that we dreamed of, especially as post-college house hunters in 2008. The undeniable reality of our poor timing in life left us with student debt, meager savings, and few job prospects. We had to make a choice. We had to decide if we were going to commit to the lifestyle we dreamed of living or if we were going to sell out to the expectation that we would do whatever it took to achieve a dream that was never really ours. That summer, after abandoning various other housing options that would require more of us than we were willing to give, we decided to go look at park models. We unknowingly set off on a journey that would change everything (and be our saving grace as we could not predict the decline in Chris's health in the years to come). In 2008, living tiny wasn't in vogue. The Tumbleweed Tiny House Company was less than a decade old and had only been making and selling tiny homes commercially for about five years. The Small House Society had only been around for six years. 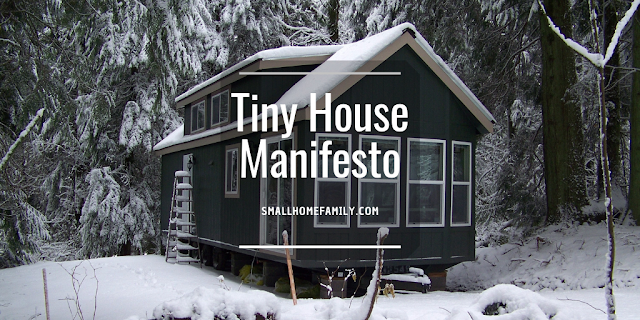 The Tiny House Blog was still in its infancy. Twitter had launched only two years prior, around the same time that Facebook opened to the general public, and Pinterest wouldn't exist for nearly more two years. The world had to wait even longer for Instagram. The first mainstream tiny house TV series wouldn't debut for six more years. Finding examples of other people who were doing what we were doing was nigh on impossible. People who lived a simpler lifestyle by choice weren't trendy: they were halfway to nuts. And they usually did it quietly, away from the public eye. "Flying under the radar" was the goal for many. When we dove into small home life head first, we had to adjust our expectations a lot. If we tried to think of our home as just a smaller version of a "normal-sized" dwelling, we got frustrated, especially as we planned for our first child. Holding on to the lingering vestiges of conventional life was rarely helpful. Learning to see our house as something else entirely was required. When we decided to sacrifice our bedroom for a nursery, we didn't talk about it much to other people. We were afraid they wouldn't understand. Yet giving ourselves permission to let our house be what it is and adjust our own expectations of what our living situation should and shouldn't look like worked better than trying to make our house into something it was never designed to be: a typical (large) American family home. 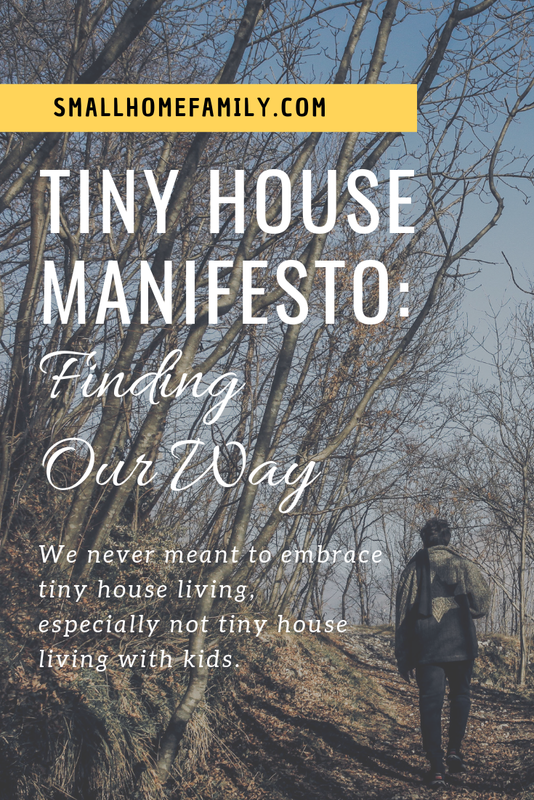 At the time there just wasn't much of a guidebook for how to do tiny house living with kids, at least none that we could find, and the best advice many people had was to move. There were a lot of things that we learned as we went along, some through trial and error (like finding a bedroom solution that works for us) and some through the inspiration from others who have chosen to embrace a simpler lifestyle like we have. Watching a family on a tiny house TV show eating at random spots throughout the house instead of trying to somehow make traditional dinners around a table work was not only enlightening but also freeing, especially as we considered the fact that we really didn't need to gather around a table to talk; we talk all day long because we spend much of the day together. Seeing kids happily share a bunk room much smaller than our own has been affirming of our decision not to upsize just to give our kids separate or bigger rooms. And watching other families stand up for a slower way of living has given us the courage to stand up and say, "We, too, are like you." We may have been early adopters of tiny house living. (We haven't met many families who have been doing this for as long as we have.) We may have spent years feeling like we were alone in a lifestyle few could understand, let alone appreciate. But as time has passed and others have come alongside us, we have found much inspiration from so many in this small-living community who truly get why we do what we do. On Instagram we commiserate about just how long winter is in a tiny house with kids. On Twitter we share stories and articles and accounts of others who, for better or worse, have found a love for all things tiny house as well. Pinterest is full of all sorts of inspiration for how to make this lifestyle work, and our IKEA KURA trundle bed hack wouldn't have happened without the inspiration we found there. I have learned to forgive myself for not taking more Pinterest- and Instagram-worthy photos in the early years of our tiny house journey when our home still looked fresh and new. After all, who could have guessed that ten years later we would be sharing our story through the likes of social media platforms that didn't even exist at the time? We were still rocking Myspace pages in those days, and we had no idea how our story and the Tiny House Movement (and the Internet) would unfold. More than ten years ago we set out on a journey toward a lifestyle that would give us the margin we craved after five years of university-induced burnout. In so many ways, our house has been a tool that we've brought along for the ride, and in the intervening years it has almost become like a friend on this journey with us. When we started, we had no idea where this road would lead and we could never have conceived of a time when we would be a part of a community of people who inspire each other to make different choices in life. What began as a solitary trek into the unknown has evolved into something so much more, and we feel honored and humbled to be a part of it.